It is usually a joy to do a root beer review of a real cane sugar brew. The Blumers Root Beer review was an exception to that rule. 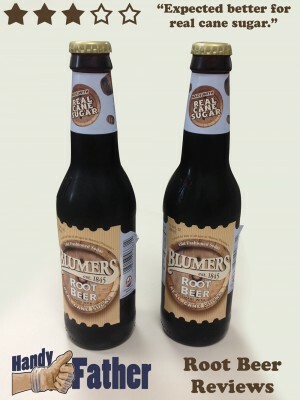 Upon opening the bottle, Blumers Root Beer has a pleasant smell. It pours nicely with good, dark color and head. The problem, and I think the worst problem a root beer can have is that it lacks flavor. Some reviewers expressed that it was slightly diet-like in taste, but a more apt description would be that it’s a watered-down flavor. There are hints of flavors that work well together to make a decent root beer, but the apparent lack of said ingredients left much to be desired. Handy Father generously gives the Blumers Root Beer review a score of 3.0 out of 5 stars. This beverage could easily become a 4+ root beer if they up the flavor ingredients. Blumers is a “healthy root beer”, but why on earth should that mean it can’t taste good? C’mon Blumers Root Beer! Have you tasted Blumers and have you own opinion? I’d love to know about it in the comments below or you can tweet @handyfather.